If the mommy-to-be or the daddy-to-be drives a truck, you're going to want to take a look at these super cute truck baby shower invitations for a little boy baby shower. Browse now to see our hand-picked favorites! This post contains affiliate links. Read our full disclosure HERE. For when the bundle of joy is a new baby boy, this adorable baby shower invite features a blue retro look truck with wood sides and a blue and white checkerboard border and back. Size: 5" x 7"
A cute construction theme to welcome a baby boy who's under construction features a big ole dump truck, street signs, chalk-like lettering and a fun chalkboard background. Size 5" x 7"
This all boy baby shower invite features a red retro firetruck on a wood look background. It's a modern day presentation of a vintage baby shower theme. Very fun! Size: 5" x 7"
Adorable rustic baby blue truck design is the perfect choice for his first special occasion.Features a retro style truck pulling an "It's a Boy!" banner. This fun invite with a little red retro truck invites your guests to "truck on over' for the baby shower. 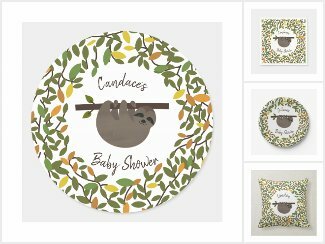 Size: 5" x 7"
All of our gorgeous featured baby shower invitations are brought to you by Zazzle and were designed by the shopkeepers there. Each one comes complete with a white envelope and Zazzle's 100% satisfaction guarantee. Oh. Em. Gee! 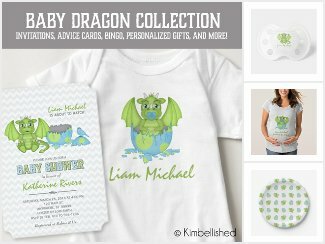 I just found the cutest dragon baby shower invitations and was so happy to discover that there were all kinds of great gifts and party supplies to go with it. If the mommy and or daddy-to-be are into dragons, you need to take a look at this adorable design. Cute, right? It looks like the little green guy was just hatched out of his blue and green polka dot dragon's egg. The fun lettering, the little blue bird, and the gray Chevron stripes in the background add a bit of excitement too. The personalized 9 inch dragon theme paper plates make a nice addition to the shower and if you're looking for something unique to put on them, why not get some matching dragon shortbread cookies. You can get a package of 4 or 12. They can be eaten at the party or send one home with each guest as a party favor! As for the matching gifts, there's a scrumptious little baby Onesie shirt with the image of the cute baby dragon on it. There's even matching Thank You cards so you can tell everyone how much you enjoyed their thoughtfulness and company at the shower. These can also be gifted to the parents so they'll have them as soon as they need them to fill out and mail. There's also some fun matching word games to play at the baby shower. I couldn't help but notice that elephant theme baby showers are HUGE right now. Pun intended. That's why today Seasonal Showers is celebrating these big lovable pachyderms with a Top 5 baby shower invite list. ​This fun theme is popular for both boys AND girls so I've mixed it up a bit with my choices today. Browse through and click on your favorite to learn more and/or order today or visit Elephant Baby Shower Invitations to see them all. With it's pink watercolor flowers and cute elephant sitting in the middle, this one is extremely cute for a baby girl. If you're looking for a modern design for a baby boy, this elephant invite with it's cute blue and white polka dots and gray and white chevron stripes is perfect! Another floral watercolor design for the new baby girl. This one has the parent pachyderm by the baby's side. Fun lettering and a jungle frond design make this one seem a bit vintage with a modern twist. If it's a boy, this one is a joy! The mommy and baby elephants on this one are connected at the nose with pink and white bunting overhead. So simple and yet super cute! ​All of the custom and personalized invitations at Zazzle come complete with a white envelope and a 100% satisfaction guarantee. You can shop Amazon for Elephant Baby Shower Invitations too! There are no ugly ducklings here! We've collected our five favorite Pink Swan Baby Shower Invitations for your viewing pleasure. Each of the following can be easily personalized with all of your little princess's first big party information. ​Click on your favorites to learn more or to order yours today! This post contains affiliate links. If you make a purchase after clicking on a link here, I will make a small royalty from the sale but this will never cost you anything extra. Watercolor illustrations are popular right now and we fell in love with two of the cutest watercolor swan designs. The one shown above features a mommy and her baby in blush. The one below is similar but has a beautiful green leaf and floral wreath around the illustration. Vintage images are also very trendy. This one shares some lovely vintage art of a swan and two baby swans framed above and below with a green border and pretty pink on pink floral design. The next invite we've chosen to showcase here features a pretty little girl asleep in her swan-shaped bed, reminiscent of Hollywood glamour girls from days gone by. Last but not least, we've chosen to show you this pretty pink and white striped baby shower invitation that has a bit of modern flair. The swan on this one is more subtle and appears in a bubble design at the top. You can purchase as many, or as few, invitations as you need. Each invite comes complete with a white envelope. ​At Zazzle, your satisfaction is always 100% guaranteed.